Gamma-ray bursts. We tend to think of them as big explosions - but it has been suggested that they might actually be Small Bangs. Credit: NASA. 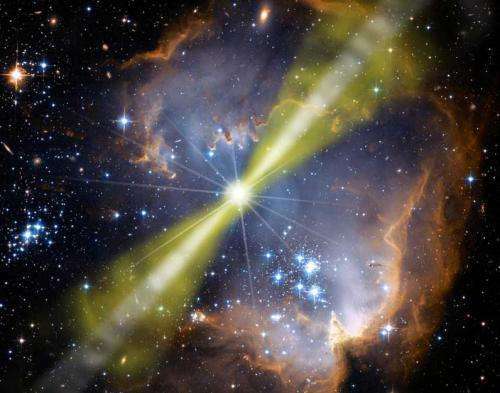 Most gamma-ray bursts come in two flavors. Firstly, there are long duration bursts which form in dense star-forming regions and are associated with supernovae  which would understandably generate a sustained outburst of energy. The technical definition of a long duration gamma-ray burst is one that is more than two seconds in duration  but bursts lasting over a minute are not unusual. Short duration gamma-ray bursts more often occur in regions of low star formation and are not associated with supernovae. Their duration is technically less than 2 seconds, but a duration of only a few milliseconds is not unusual. These are assumed to result from collisions between massive compact objects  perhaps neutron stars or black holes  producing a short, sharp outburst of energy. But there are also rare instances of gamma-ray bursts that dont really fill either category. GRB 060614 is such a beast  and has been referred to as a hybrid burst. It had a long duration (102 seconds) but was not associated with a supernova. This finding was significant enough to warrant an article in Nature  with the lead author Gehrels stating "This is brand new territory; we have no theories to guide us." We should be grateful that no-one decided to call it a dark burst. And we are yet to see another such confirmed hybrid gamma-ray burst that might verify whether these are hybrid bursts are really something extraordinary. Nonetheless, Retter and Heller have suggested we should consider the possibility that GRB 060614 might have been a white hole. A white hole is a theoretical entity  and arguably just an artifact of the mathematics of general relativity. Assuming a black hole is an object from which nothing can escape  then its symmetrical opposite would be a white hole into which nothing can enter  but which can radiate light and from which matter can and does escape. Arguably the whole idea just arises because general relativity abhors sharp edges. So the argument goes that the space-time continuum should ideally extend indefinitely  being curved by massive objects, but never brought to an edge. However, black holes represent a pinch in space-time where everything is supposedly dragged into a point-like singularity. So, one solution to this problem is to suggest that a black hole is not an interruption to the continuum, but instead the space-time around a black hole is drawn into a narrow-necked funnel  essentially a wormhole  which then feeds through to a white hole somewhere else. Left image: The mysterious hybrid gamma ray burst GRB 060614. Right image: The 'what goes in must come out' model of white holes - where a black hole is connected to a white hole - and the white hole is time-reversed so that it expels material in the past. This was an initially proposed as a solution to explain quasars in the early universe, but better explanations have come along since (e.g. supermassive black holes with jets). Being opposites, a black hole in the present would be connected to a white hole in the past  perhaps a white hole that existed in the early universe, emitting light and matter for a period and then exploding  kind of like a film of the formation of a black hole run backwards. Its been suggested that such white holes might have created the first anisotropies in the early isotropic universe  creating the clumpiness that later led to galaxies and galaxy clusters. Alternatively, the Big Bang might be seen as the ultimate white hole which expelled a huge amount of mass/energy in one go  and any subsequent white holes might then be lagging cores or Small Bangs. There are substantial theoretical problems with white hole physics though  for example, the matter it ejects should immediately collapse back down on itself through self-gravity  meaning it just becomes a black hole anyway, or perhaps it explodes. If the latter possibility is correct, maybe this is one possible explanation of GRB 060614 seen back in 2006. But its probably best to wait for another hybrid burst to appear and get some more data before getting too carried away here. Gets five stars for that statement alone. First time I've seen anyone else actually mention that. There is, of course, an exception. If all or most of the mass coming out of a white hole was in the form of energy as EM radiation, then the energy, moving presumably as gamma rays at the speed of light, could escape any given gravitational shell over substantially long time periods before enough solid "matter" accumulated in the lower shells to produce an event horizon. So the higher percentage of a white hole's energy appears as pure EM radiation, the longer it's life time before it would collapse, and the more energy would be able to totally escape. If all of the escaping energy was as 100% EM radiation, then there would never be a gravity well. One of the problems with the physical theoretical explaination above is that it creates a partial time loop, in which some events in the past are partially influenced by the future, and potentially even events outside their own light horizons. The result of this is that some events, as seen from inside the system, would appear to have no rational or logical relationship, and LOCALLY, conservation laws would not be maintained. For example, if a small white hole tied to a small black hole of several quadrillion kg mass had formed in the core of a planet, it would heat the planet substantially through pure gamma radiation, but an observer would initially not be able to tell whether the heat was coming from an ordinary nuclear process from an abnormally high radio isotope concentration, or whether some other process was at work. The only way to tell the difference would require extremely long time scales to prove the nuclear energy should have dissipated. 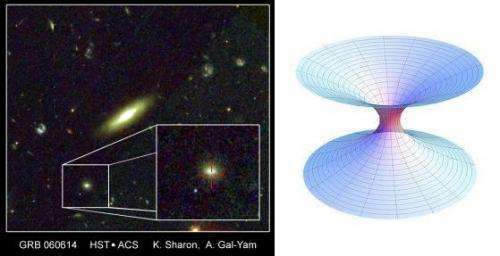 Its been suggested that such white holes might have created the first anisotropies in the early isotropic universe creating the clumpiness that later led to galaxies and galaxy clusters. If you had a rotating super massive white hole which is old enough, you would not be able to tell the difference as compared to a supermassive black hole. Both would appear at the center of galaxies, and the white hole will have ejected enough matter over a long enough time that it would have become a black hole as well, with some of it's original ejected matter having had the fortune of having the exact angular momentum to form stable orbits, while other portions of it's ejected matter would appear as jets, or else would have been moving with such high velocity that they totally escaped the white hole before it became a black hole, and thus expanded into intergalactic space and became indistinguishable from the intergalactic medium of gas. One other paradox this would create. If time is continuous (yet relative to the observer,) and white holes tied to any given black hole can be created at a random point in space-time determined somehow through time reverse quantum mechanics; then it would stand to reason that some white holes could be created so far back in time that they would appear "older" than the universe itself in any given reference frame, and with no logical way for an observer to prove or disprove one way or the other, whether it was a white hole galaxy formed by a time loop, or whether black hole galaxy formed by accretion. Thus, the existence of white hole galaxies which subsequently collapsed to black hole galaxies would artificially inflate the age of the universe in a feedback mechanism, by making "new" galaxies farther and farther in the past. So that produces an "open" causality loop, which then undermines the practice of "time reversing" the universe to study it's history. If white holes exist, then you can't tell what aspects of the past were caused by the past, or what aspects of the past were caused by the future. The universe would still not be a closed time loop, because some of the EM radiation from any white hole would always manage to escape before the mass reached a critical state to make a "new" black hole for the same reason some radiatin escapes a collapsing star just before it becomes a black hole. Most of this radiation just ends up traveling through empty space for all eternity until it hits the light horizon. Yes. This is right up his alley. I can't wait to read the response. It's a valid, real numbers solution to general relativity. QC, while you seem to have a lot to say, you should try running your ideas by somebody before wasting all of our time here. Maybe it is just the latent anger that irritates me. Not too bad on this article though. If white holes exist, then you can't tell what aspects of the past were caused by the past, or what aspects of the past were caused by the future. .. In essence what is suggested in this article is part of my theory of the "Mobius Universe." It's time we discover what space actualy consists of. Why were they not called 'little bangs' instead of small bangs?